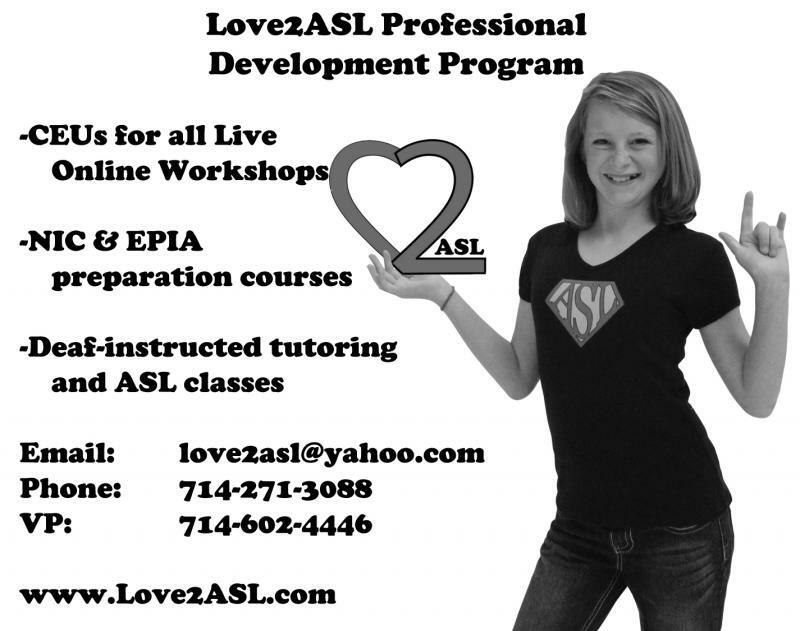 LOVE 2 ASL - ﻿ASL WORKSHOPS 2019 "ARCHIVED" WORKSHOPS ARE HERE 24/7 ===============>﻿ ﻿View as many times as you want and for up to 30 days per archived workshop video. Live Online Workshops will be announced when available and will be available one time when viewing live online. BUNDLES- 3, 4, 5 & get 1 Archived Webinar Free - Click Here! ***TESTIMONIES*** How I Passed The EIPA!!! CODA...CHILDREN OF DEAF ADULTS, INC.
﻿View as many times as you want and for up to 30 days per archived workshop video. Live Online Workshops will be announced when available and will be available one time when viewing live online. To Register, Go to PayPal, Sub-menu ASL WORKSHOPS and select the Workshop of your choice. You will receive instructions at the email you have registered with in PayPal within 3 days or less.